What Should I Do If My Water Pressure Changes? Check your faucet screens and valves for possible clogging, then check with your neighbors to see if they are experiencing any similar problems. If so, call the Public Utilities Billing office at 540-434-6783 or the Operations Center at 540-434-9959 for further recommendations. What Do I Do If the Water is Not Running Through the Faucet? Check all of your valves, especially your main valve, and check your faucet screens. Then call the Public Utilities Billing Office at 540-434-6783 so a city service professional can determine the problem. The problem may be in the city line. You will be told if you need to have your pipes checked by a plumber. The City cannot pay for your plumber service. Who Do I Call About Dripping Faucets? Many dripping faucets can be remedied by changing a washer. If the leak persists, call a plumber – leaks can become expensive. All usage and maintenance fees are the responsibility of the customer. What Do I Do If the Commode Sticks After Flushing? A commode that continually runs is an expensive water waster. By placing household food coloring into the tank of the commode, they can determine if water is running. If you do have a problem, you must employ a plumber. All customers must pay usage and maintenance fees. Is There an Adjustment for Watering Lawns? No. However, you can purchase another connection, a second meter, for the exclusive purpose of water usage for lawn care, avoiding a sewer fee. There is a connection fee for this meter however. What Should I Do and Who Do I Call If My Water Consumption Rises Drastically in One Month? Check for running commodes and leaking faucets, garden hoses, etc. Then call the Public Utilities Billing Office at 540-434-9959. Explain your problem. Someone will reread your meter and listen for leaks in your line. Can I Have a City Water Service and Another Water Supply at the Same Time? No. There can be no backflow connection between a public and private water supply. Virginia Waterworks Regulations dictate the conditions with some permitted exemptions. What Should I Do If Sewage Begins to Back Up in the House or in the Plumbing Fixtures? First, do not run any water into the fixtures and call the Public Utilities Operations Center 540-434-9959 or the emergency response number. It could be a problem with a city sewer line. You will be told by a city employee if you need to call a plumber. If you call a plumber first and it turns out to be a city problem, you will not be reimbursed for the plumber's fees. Some discharges are illegal while others are approved through special permits. In general, contact the Water Operations Center at 540-434-9959 for information about restrictions or necessary permits. The City ordinance prohibits connecting drain spouts or drain pumps to your sanitary sewer building lines. Unpolluted water should be routed to storm drainage systems. Misdemeanor charges and monthly surcharges are enforcement actions which are available to the Department of Public Utilities. How Should I Fill and Discharge Water from My Pool? Water customers should contact the Public Utilities Department at 540-434-9959 for advice on the best way to fill home swimming pools. Most customers fill their pools from their existing water meter. There are other options, such as installing a separate water meter for your pool, having the Fire Department fill your pool and obtaining a "Water Use Agreement" upon payment of fee, or obtaining a fire hydrant use permit. Due to the chlorine and chemicals used, pool water is contaminated and must be disposed through the city’s sanitary sewer system for treatment and discharge. Sewage charges are applied to all pool applications unless you qualify for an exemption. Qualifications for exemptions are determined by the Public Utilities Director. Can I Access or Move My Meter Box? Improper access to meter boxes will cause damage. You will be held responsible for damage caused by you or your plumber. 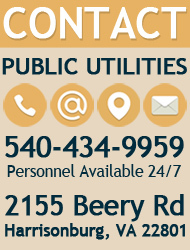 Contact the Billing Department 540-434-6783 for assistance to access your meter box. Contact the Operations Center 540-434-9959 to have a meter box moved. Relocation of meter boxes, if performed to accommodate building or landscaping, will be billed to the customer.